Result of TBS "$1,000 Challenge"
TBS was represented at the "$1,000 Challenge" on 9/10/99 by chairman Terry Smiljanich, vice-chairman Miles Hardy, videographer Glenn Thompson, and myself (as executive director). The claimant, James D. Moore, Jr., was accompanied by his girlfriend and several other friends. Prior to commencing the "Challenge," I explained TBS's position regarding the anticipated outcome (i.e., approx. 50% right and 50% wrong) and the reasons why such an outcome would be expected. Mr. Moore stated that he did not simply "believe" in his ability, but "knew" that it was genuine. Therefore, he was very confident that he would be 100% successful. If not, he said, he would get all the boxes wrong (i.e., his divining rod would react exactly backwards each time). When I asked how he would explain a "50-50" result, should it occur, Moore strongly affirmed that such would not happen. When further pressed for an answer, he could not come up with any explanation since, as stated above, if things weren't working correctly, the result would be 100% backwards, not a random mixture of correct and incorrect. Thus, TBS agreed that, should Moore get all 23 boxes wrong, we would award him $500 and test him again (unless James Randi agreed to then test Moore for his foundation's $1,000,000 prize based upon his 100% incorrect performance -- a feat equally as unlikely as being 100% correct). During several earlier telephone conversations, I had reminded Moore to make a few extra boxes so that he could have some "practice" runs just prior to commencing the formal "Challenge," and he had agreed to do so. He would be told in advance the contents of each "practice" box, and would thus be able to make sure that his rod was working properly under the test conditions. But he failed to make the extra boxes. After the Protocol documents were signed, I told Moore that the first of the 23 boxes would now be placed in front of him (Moore requested that they be laid on the floor rather than the table). The boxes were approx. 6" x 6" x 2" high, handmade of lead, and open at the top. Two days prior to the "Challenge," the boxes and the specially cleaned sand had been brought to me by one of Moore's friends. That evening I had buried a gold coin (one-ounce South African Krugerrand) in 11 of the boxes, and a thin wafer of unfinished aluminum in the other 12 boxes. The boxes sat in my home until I drove them to the "Challenge." I had also brought to the "Challenge" a supply of gold and white-colored pieces of paper, and suggested that if Moore said that a box contained a gold coin, a gold paper would then be placed on top of the sand to document his selection (and white paper for the boxes that Moore determined contained aluminum). But Moore vetoed that idea, preferring that no extraneous items be placed in the boxes, since he had the right to re-check his findings toward the end of the "Challenge" after dowsing over the 23rd and final box. Therefore, at his request, we simply moved the "gold" selections to one side of the floor, and the "aluminum" to the other side. Moore took an average of less than 10 seconds apiece to "divine" the contents of the 23 boxes. Although I had expected dramatic movements in his "Y" rod, I didn't appreciate any significant difference in the reactions between "gold" and "aluminum." But Moore confidently pointed each time to which side of the floor the box should be moved, before the next one was placed in front of him (as Thompson taped the proceedings, Smiljanich, Hardy and I took turns placing the boxes in front of Moore and then moving them aside). 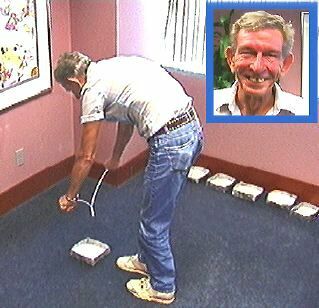 After completing the 23rd box, Moore then passed his rod once again over all of his "gold" selections (constituting 12 of the boxes), and moving to the other side of the floor, did the same with his 11 "aluminum" selections. He expressed confidence that he had done well and, when questioned, affirmed that he had not simply "guessed," but that his rod had definitely reacted differently to the "gold" boxes than to the others, just as in his practice sessions at home in which he enjoyed 100% success. At that point, the TBS "$1,000 Challenge" was officially certified as having been completed, and the time had come to begin divulging the results. One by one, the boxes were placed on the table, and Moore was asked to "fish out" the object buried in the sand. The first box, in which Moore's "Y" rod had detected the presence of gold, turned out to contain an aluminum wafer -- Moore had "lost" the "Challenge." Of the 12 boxes that Moore thought contained gold, only six did; the other six contained aluminum. In all, Moore turned out to have been correct with 12 of the 23 boxes, and wrong with 11, exactly as one would expect from chance guesswork. Following the divulging of the results, Smiljanich, Hardy, Thompson and I all explained to the Moore contingent, once again, the meaning of the results from our perspectives. As anticipated, Moore was unwilling to entertain even the possibility that his "divining" abilities were not genuine (i.e., that due to a lack of proper controls prior to this test, he had simply been deceiving himself for years). Rather, Moore began rationalizing his failure in this experiment, inviting us to take a trip to a spot in Georgia where he claims a history of "one thousand percent" success in his previous efforts when objects were buried underground. As for our own "Challenge," only now did Moore claim that the "magnetic fields" in the boxes had been "transformed" because the same person did not place all of the boxes in front of him, as he now said should have been done. He blamed his friend/associate (who had brought me the sand-filled boxes) for not having told us about this beforehand. But we countered that Moore had failed to raise this point earlier, even as he watched us placing the boxes. Moore also claimed that he would have done better had the boxes been sitting in the Green Room for the past two days instead of in my home. But the purpose for having made the boxes out of lead, and for supplying specially processed sand, was to shield the buried objects from any outside influences that might disrupt his ability to dowse. During the "Challenge" his rod seemed to him to be working just fine (he voiced no complaints about any ambiguous reactions due to interference). And, as he told us both before the test began and just before the results were divulged, if the results were to turn out "50-50," he would have no explanation, since (as previously discussed) the only two conceivable possible outcomes to him were 100% correct and 100% incorrect. Despite our disagreements, there were no hard feelings expressed by anyone, and Miles Hardy even offered to follow up with Moore about the possibility of testing him again in Tampa, next time actually burying objects in the ground rather than using boxes. Moore then handed Hardy a business card, which indicates that Moore actually resides in the town of Hawthorne, just outside of Gainesville. The card further proclaims: "THE CRAZY ROD: Einstein predicted it -- we did it. Rod and instructions $39.95." Moore told us that he had sold only three "Crazy Rods," and that they were no longer being marketed. His friend/associate had earlier indicated to me that Moore had sold about 100 of them. In my opinion, a "50-50" result in a follow-up experiment still would not shake Moore's belief in his abilities. But his friend/associate has acknowledged to me that our "Challenge" has opened his own mind as to the genuineness of Moore's abilities, and the utility of the "Crazy Rod." For me, that's about all I could have hoped for.